ROG Phone vs Razer Phone 2: which gamer phone do you think is better? Last year, Razer crashed through the smartphone scene with its own brick of a smartphone — the Razer Phone. A large, rectangular device that made absolutely no apologies for what it is. It aimed to deliver a pristine gaming experience, with huge front-firing speakers, proper processor cooling, and a 120 Hz display. For that reason, the company had no issue with launching a phone with huge bezels and neither did most of the community, it seemed. And this year, the Razer Phone 2 is... a lot of the same. Large, boxy, unapologetic. But Razer might need to start worrying. A year has passed, and others are also looking to take a piece of the "gamer niche" pie. Notably, Asus has launched a smartphone under its own gamer brand — Republic of Gamers. It's called the ROG Phone and boy does it come with a heap of features! First and foremost, its design is sleeker, more ergonomic, and can look techy and cool or corny and pretentious, depending on your viewpoint. The ROG Phone also has front-firing stereo speakers, but thinner bezels, and it does sport a 2:1 display aspect ratio where the Razer Phone 2 sticks to 16:9. Then, we have the cool trigger buttons that are embedded in the ROG Phone — tapping on the frame with your fingers can act as aim / fire buttons, making shooters much more enjoyable to play. And to top it off — a ton of accessories, from an external fan that keeps the phone cool and charged for longer periods, to a controller bed that transforms it into a portable console. So, did Razer make a mistake by reiterating the same phone this year? Does the ROG Phone have it beat in 2018? Razer Phone 2 or ROG Phone? Razer Phone 2! The ROG Phone has this one! The ROG Phone has this one! They are both overpriced needless tech. Such a waste if components, that aren't even that great compared to phones like the S9+ or Note 9. The games on the Play Store, most aren't even powerful enough to take advantage of paying these grossly ridiculous prices. They both lose! What? This isnt about being a fan. A gaming phone is simply a dumb idea. The games available to Android, dont exceed the power of today's top A droid device. No matter the OEM. Just because I like a brand, doesnt mean something else can't be a good option. The hardware in those phones are even better than many too their phones, so why should I buy it. It can play the same games I already play, and it doesnt play them a y better. Especially since on my phone I can adjust resolution, I can adjust frame rate and change how fast the CPU/GPUpushes graphics data. Not saying ever device has to be practical. They do need to make since. Gaming phones have zero purpose and are just flare and hype that cost too much. Doesnt matter what ohone I own or use. What exactly is it better at? Even though I hate benchmarks, the ones PA posted here, showed the phones received their score of 4, whole the Note 9 vote 9 score. So which one of these is better? According to GSMarena, the Razer is rated at IP67, while I have IP68. The display on the Razer is LCD, while I know for a fact no phone sold right now has a superior display vs the Note. The Note also has a higher resolution and its bigger at 6.r vs 5.7 and 6.0. The ROG is only 1080p. The Note 9 supports HDR 10. The other 2 do not. The ROG supports some type of HDR. But not industrybstabdard one. Note offers Super slomo, they dont. The Note has a much better front facing camera. Notebsupportsb32bit audio, while they only support 24bit. Note also supports Dolby ATMOS. In this case only the Razer does. Otyer than the fast charge 4.0 they have, what is actually better about these 2 over the Note? I will await your reply. But you wont reply because the Nite is gonna be better at gaming. And the benchmarks of the Nite vs these 2show the same. Good luck on you trying to make a big deal of a phone you aren't even gonna buy and "likely" can't afford. You know that there are other brands and that not everyone likes or needs yours Samsung spec's. Razer phone has clean android so it will be faster than Samsung. And this article is about specific two smartphone's. And none of them are Samsung. So if you so say that you are not Samsung fanboy than don't start to write about how in your opinion Samsung is a better phone brand on an article witch has nothing to do with Samsung!!! Haha. I mention Samsung ro comparison hardware capability and price. The S9+ and Note 9 both have better hardware, which means it will game better. One of these phones cost $1150 EUR, which is more than I paid for my Note 9, yet its hardware is less capable overall. Are u gonna buy one1? Because if not your whole argument is moot. I like all tech. This tech is a solution to a problem we dont have. Lol "better hardware game better" 120Hz refresh rate, better liquid cooling, bigger RAM, bigger battery begs to differ. ROG phone's OLED display is pretty sweet. Razer phone 2 cannot compete with ROG. The lack of an SD card slot on the ROG phone is such an utterly baffling decision. For a device that should be doing everything to support emulation, this is just a really big thing to overlook. With storage options of 128 and 512GB, why do need a SD card? What are you going to do? Install 40GB worth desktop games on the phone? Lol. Yes? If somebody is buying this as a gaming device, this is a perfectly valid option. I am a huge advocate for expandable storage, however for a "Gaming" device I understand not including the sd card option. The people who this is marked at and who will buy it based on the "Gaming" label are not typically the most informed and hence not allowing the option of external storage that will degrade the experience if someone where to choose to load apps to it is probably for the best. I have a 128GB micro SD card completely filled with nothing but ROMs. So yes, a micro SD is needed especially for emulation which would be the only reason to buy a dedicated gaming phone. They're both trash and serious gaming on a phone is a joke. Agreed. Serious gaming should be on consoles or high end PCs + large screen. But think about the upcoming years for smartphones, the competition has to start at some point. Remember playing Snake and Tetris years ago? I wouldn't have dreamed back then I'll be playing the games on my phone today. And yes, discrimination on portable gaming is still rampant. There are recipes that console and desktop gaming can't do, vv to portables. "Serious" and casuals shouldn't be compared too. It's tough because ASUS has been out for a while and Razor hasn't in the mobile world. Razor's phone just looks so good and has amazing speakers and performance, but ASUS has been there before, and all those dual type c add-ons are pretty cool for the most part. Razer phone 2 has: 1.ip67 water resistance 2. 120hz sharp igzo screen 3. Bigger front facing speakers 4. Wireless charging 5. Micro SD card slot 6. Nova launcher prime already installed. Vs the Asus ROG phone which has: 1. 90hz oled screen 2. Air triggers 3 dual USB c ports. 4. Headphone jack. 5. Various accessories. 6. Overclocked snapdragon 845. 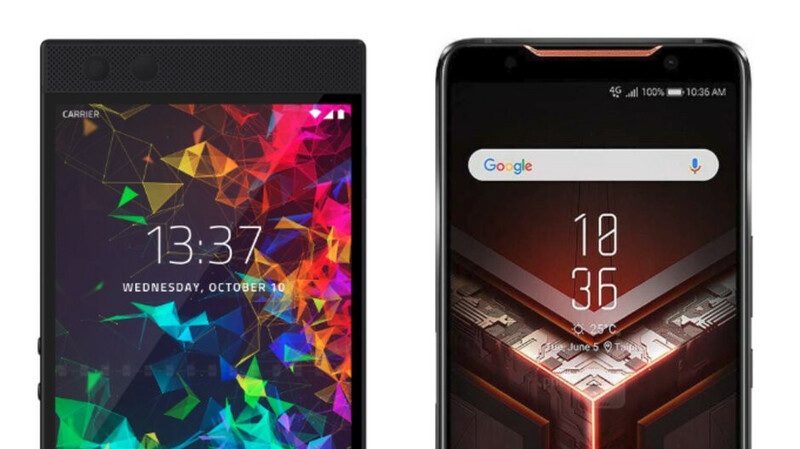 Both are good phones in their own way but I feel the Razer phone edges out the ROG phone by being cheaper yet just as premium and with features the ROG doesn't have. 1. Asus ROG phone has equally good speakers. Don't go for the cosmetic grill size on Razer. Below them are tiny vents. 2. Asus ROG phone has 30 watt charging. Charges like crazy. 3. ROG has specially binned higher clocked S845 CPU and GPU. 4. It also has a better cooling tech with vapour chamber as well as carbon cooling pads. 5. ROG also looks better, in hand feels better and has smaller bezels. 6. Probably even the cameras are better. Not to mention the other pros mentioned by you. Razer is more of an everyday, practical phone. Regardless, gaming on Android is trash and everyone knows that people game on iPhones more than anything else. Games on iOS are just soo smooth. Also, because Apple A series chips are so poorly optimized, they actually push the batteries into degrading faster. Which is why iOS 12.1 brings Capau throttling to iOS for all the latest iPhones from the 8 to the X's. The 8 and X are only one year old and because apple continues to use cheap $5 rechargeable Rayovac batteries from China, theirnphones can't sustain a y optimum gaming performance for more than maybe an hour. Yes all phones throttle when chips get hot, but in the case of Apple, it's not even about heat. It's about great hardware running on a cheap power sources and ruining the experience. Sorry, Samsung dowsnt need to throttle its phones. Cups and GPUs without active cooling already have a threshold for lerformance. The iPhone reach thatvfar a d away faster than my Note 9. I can game at full speed for hours thanks to smart moves like heat pipes and better design of the case. Samsung pays less for its batteries, because they own the company that makes them. What are you talking about? See again you know nothing about business. If I own a company that makes batteries, why would I pay full price for them? With Samsung we pay less and get more. Period. The iPhone has turned into a Mac. I got 2 Note 9, 512GB and 128GB for the price of one iPhone XS 256GB. But you worried about battery cost that an OEM pays. If I own a car shop when I bring my car in, I expect I would pay less for it. Right? Do you think Paris Hilton, pays full price to sleep in a hotel that bears her name? For once once in your life, have an actual thought process, before you speak. For years Samsung phones have cost more to make than Apple iPhone. Even though you also pay more, the iPhone does not do what a Galaxy does on any level. Proof? Are you saying that Apple does not get any discount specially if they buy more than any galaxy phone out there? Proof?. The proof is that millions of iPhone users are on the charger by lunchtime. Also the fact that Apple has to throttle their phones after only a year due to battery degradation. Is that proof enough for you. You don't know wtf you're talking about. My 1 year old iPhone X battery capacity is at 94%. Do you know how many more years it will take before the throttle kicks in? Razer phone has a higher refresh, higher resolution, RGB and cost less.